Suggested correction: Why does it matter. They added a fifth. No reason after making up a lot of history and a cover to cover book instead of a scroll for us to suddenly go, hmm, they gave the ten plagues of God in the Bible to an Egyptian priest? Lions are cats. Therefore worship, plus the lioness goddess who slew through the land once. 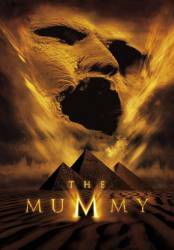 They can certainly add that and might make it a nicer play on the mummy's power and deadliness comparatively to the canopic heads and their gods. A better excuse is the fact that the earliest found canopic jars are from the 11th dynasty (2200 BC) whilst the jars in the movie are way older than that (2700 BC) and could have represented anything they wanted and be more than 4. Someone should make a correction like that. There is no real excuse. It is simply an inaccuracy and the trivia section to include it as such. It certainly "does matter". Continuity mistake: Ardeth Bay removes the Lewis gun from Winston's plane after it crashes in the desert. If you look at the gun, it has the correct 97 round drum (it's really noticeably thick) with a leather carrying handle on top and no paint marks on it - this is correct for aircraft use. Aside from the fact we never see Ardeth Bay remove any spare magazines for it (which would also have been of the 97 round variety), which would have left the gun with little if any ammunition after shooting at the wall of sand, by the time they all arrive in the treasure room, the magazine suddenly changes to the 47 round variety (thinner than the 97 round magazine), which does not have the leather carrying handle, and has the painted marking on the top of it to enable the magazine to be more easily changed at night. Factual error: Due to the Earth's rotation, the mirror system used to light the tombs would only provide light for about 4 minutes before needing readjustment (tested by the Mythbusters). This would be fine when there were plenty of priests around to adjust them constantly but the light level never changes even though we see Rick and Evie for several minutes at a time. Continuity mistake: When Evie wakes up and sees the rat on her and freaks out, she rolls over and sees the body of Anck-Su-Namun, and screams. About half a second before the camera cuts, you can see a large crack form in the top-left corner of the table that Anck is lying on. Later on, when you see her again, the crack has disappeared. Obviously, it was unintentional damage done to the set that was later fixed. Continuity mistake: In the scene where Imhotep's sarcophagus is opened: Rick and Jonathan stand the sarcophagus up against the wall, and Evie steps a few paces away and stands in front of it. Then the "lid" falls on the floor, where Evie was standing. Then Evie approaches the juicy corpse of Imhotep from an angle. Next she is seen stood directly in front of him, where the lid should be, yet the lid has mysteriously disappeared. Other mistake: In the gunfight on the Nile-boat, you can often see (and hear) Rick fire his revolvers 20-24 times in totum without reloading. The guns he has would only take 6 rounds per gun (MAS 1873 revolvers). 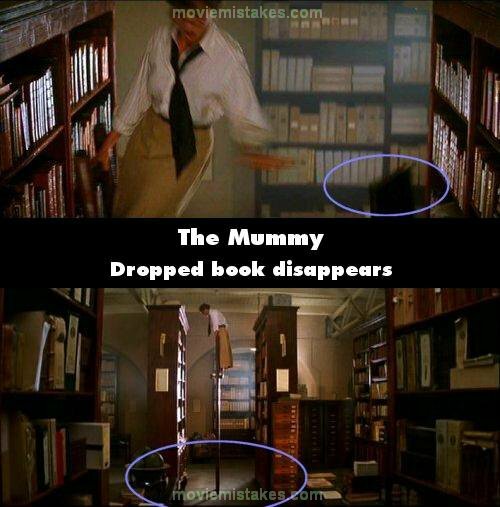 Continuity mistake: When the biplane dives from the sandstorm created by the mummy, it shows Evelyn looking towards the plane, with the city of the dead behind her. The plane is seen, from her viewpoint, to be flying away when it crashes. However, after the plane sinks O'Connell and his friends walk in the same direction that the plane was flying, presumably AWAY from the city of the dead but the camera shows them walking towards it. Continuity mistake: During the scenes when Rick, Evelyn, and Jonathan are walking through the passageways by torchlight, Rick's leather wrist bracer disappears and reappears. Continuity mistake: When Imhotep's priests break out of the ground, we see a shot of Ardeth, Jonathan and O'Connell starting to shoot them. It flashes back to the priests and then back to the trio and we only THEN see Jonathan reach over and grab some revolvers from beside O'Connell to start shooting. Evelyn: You know, nasty little fellows such as yourself always get their comeuppance. An explanation for why there is no salt acid booby-trap protecting the gold book like there was protecting the black book. In the missing scene some of Imhotep's priests burst through the floor/ground and attack Jonathan and Rick, who get tossed aside. The priests then open the gold book's hiding place and get burned all up by the salt acid. You can even see when Rick grabs the TNT that there is smoke rising from the hole.